CORTE MADERA, Calif.--(BUSINESS WIRE)--Jun. 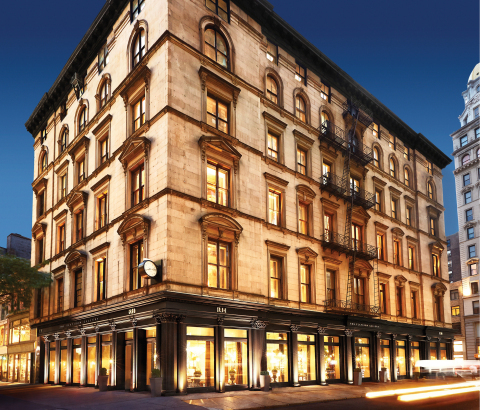 26, 2014-- RH (Restoration Hardware Holdings, Inc.) (NYSE: RH) announces today the opening of RH New York, The Gallery in the Historic Flatiron District. The 19th-century building is located at 935 Broadway in New York City with entrances on both Broadway and 5th Avenue at 22nd Street. With three floors and 30,000 gross square feet, the newly expanded Gallery is three times its previous size, featuring a dramatic antique mirror-lined grand staircase with custom-designed iron handrails inspired by the late Venetian architect Carlo Scarpa that elegantly traverses you up to the new floors on levels two and three. The new Gallery features an expansive offering of the brand’s recently unveiled 2014 furniture collections, including pieces from the brand’s RH Small Spaces Source Book. Additionally, and coinciding with the launch of the RH Rugs Source Book, the Gallery includes a Ben Soleimani Rug Showroom that displays the fourth generation designer’s exclusive hand-knotted and hand-woven rugs for RH – as well as features the debut of his Vintage collection from the 1940s and 1950s curated during his global travels. Upon arrival to the third floor, guests discover urban, garden-inspired settings showcasing collections from the RH Outdoor Source Book in all-weather wicker, weathered teak and high-performance Perennials® fabrics presented in dramatic lifestyle compositions complete with garden decor and trickling fountains. Throughout the three floors is an expanded offering of the brand’s RH Objects of Curiosity and RH Tableware collections, unique and distinctive objects, accessories and tableware that have been curated by artisans from around the world. The Gallery in the Historic Flatiron District offers personalized interior design services, and can be reached at 212.260.9479. Hours of operation are Monday through Saturday, 10am - 8pm, and Sunday 11am - 7pm. This release contains forward-looking statements within the meaning of the federal securities laws. You can identify forward-looking statements by the fact that they do not relate strictly to historical or current facts, including any statements related to the Rug Showroom, visitors’ experience, hours of operations and personalized interior design services. Forward-looking statements are subject to certain risks and uncertainties that could cause our actual or future results to differ materially from our expectations. For further information regarding risks and uncertainties associated with RH business, please refer to the risk factors section in the Company's SEC filings, including, but not limited to, its annual report on Form 10-K and its quarterly reports on Form 10-Q. RH undertakes no obligation to update information contained herein, including forward-looking statements.